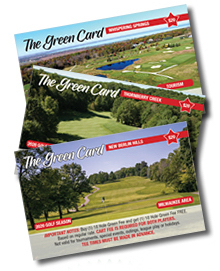 The Green Card is Wisconsin's Best discount golf card. The Green Card has partnered with some of Wisconsin's best public golf courses, The Green Card offers avid golfers an opportunity to save money doing what they love... GOLFING! Each regional card offers not one but three - BUY 1 GET 1 FREE rounds of golf for 6-8 courses in that area (cart fee required). That's 21 FREE rounds of golf and a value of over $700 in FREE GOLF per card! What golfer wouldn't want that! The card is not valid for tournaments, league play, or on holidays. Certain minor restrictions may apply to each course as stipulated on the back of the card. Motorized golf cart is required.